When it comes to desserts – which we could eat until the cows come home – we like to add some fresh fruit here and there in an attempt to “make things healthy”…here, blueberries are our weapon of choice. 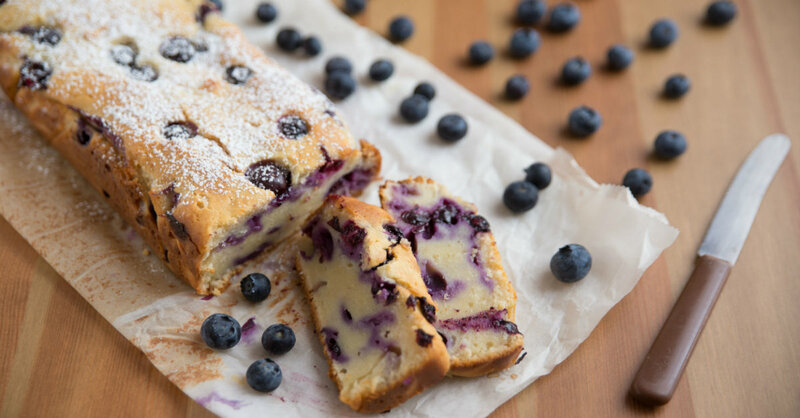 The stars of the show, blueberries are packed with antioxidants, so folding them into this deliciously moist cake, assisted by vanilla and lemon (making things perfectly sweet and tart), results in a dessert that we could eat for breakfast, lunch and dinner! Preheat oven to 350º F and grease a 9×5-inch loaf pan with butter or non-stick spray. Mix 1 1/2 cups flour, baking powder and salt together in a medium bowl and set aside. In a large bowl or mixer, cream together butter and sugar until fluffy and lightened in color. 4-5 minutes. One at a time, beat in eggs, waiting for each to be incorporated before adding the next, then mix in vanilla extract and lemon zest. In batches, alternate between adding in flour mixture and Greek yogurt, beginning and ending with the dry ingredients. Mix until only just combined. In a separate bowl, toss blueberries in remaining flour (this prevents them from sinking to the bottom of your loaf cake), then gently fold them into your batter. Pour batter into greased loaf pan and place in oven. Bake for 55 minutes, or until toothpick inserted in center comes out clean. Remove from oven and let cool 20-30 minutes before removing from pan. Dust generously with powdered sugar and serve warm or at room temperature.